carried only what they need to identify themselves. to weep for their own gorgeousness. 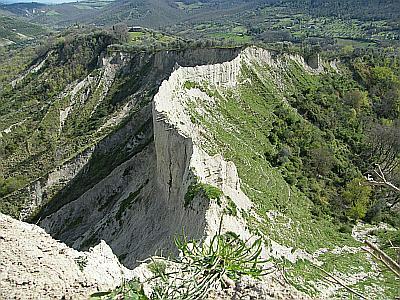 Badlands exist in Italy at various points (all of the images on this page are in Italy). 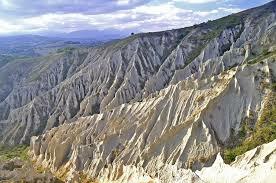 The folks over near the town of Atri on the Adriatic about 200 km north of Naples take their badlands seriously. They call theirs the Circles of Hell (from Dante's term—le bolge dell'Inferno— in The Divine Comedy). They even have a 380-hectare (940-acre) Regional National Reserve dedicated to them). Elsewhere in Italy, they exist at Val d'Orcia in Tuscany and down near the town of Aliano in the Basilicata region, 160 km (100 miles) southeast of Naples. The English word “badlands” comes from Spanish, malpaís. The Italian word is calanco, obviously kin to calanque in the langue d'oc (or Occitan) of southern France and in Corsican , which describes similar geological formations along the sea-coast. Sources tell me that a calanco is similar to a biancane, but “...the origin of biancane is associated with highly dissected surfaces along a reticular system of small joints. In contrast, calanchi [plural] are formed on steep wall-like slopes along larger lineaments where the rate of incision into the slopes surpasses the denudation of the densely vegetated back-slope.” (from "The badlands of Italy: a vanishing landscape?" C.P Phillips, Applied Geography,Volume 18, Issue 3, July 1998, Pages 243–257.) I feel more educated after that, but maybe less romantic. In truth, the only thing I really knew about "badlands" until the other day was that you can't have just one of them.